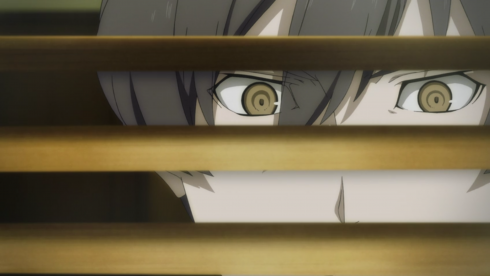 It’s another week of dense scheming and counter-scheming here on 91 Days, but as with recent weeks, the plot is a means to an end, less about what happens and more about how our main characters (re)act and what that tells us about them. Which isn’t to say that what happens isn’t well-paced, tightly narrated, sharply directed, and ridiculously tense–because h’oh man, is it ever. The sheer number of times I shouted at my monitor during “Behind the Curtain” is ample evidence of that. There are two stories this episode: New Prohibition Head Delphy Vs. The Vanettis, and Corteo Vs…Everyone, more or less. The Delphy plot is the more straightforward of the two, serving as the catalyst for the second, intimate half of the episode. Unwilling to accept bribes and unperturbed by verbal threats, Delphy pushes Nero (and Angelo) to greater extremes in order to “protect the family,” to the point where they decide to kill his family in order to send a message. 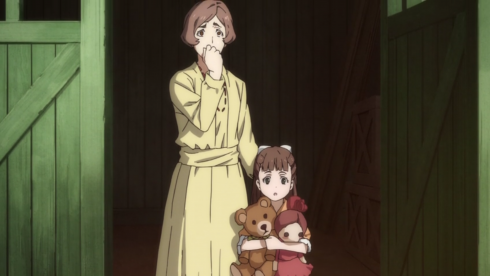 A missing teddy bear saves Delphy’s wife and daughter from the explosion (and shows that the writers have enough restraint not to murder cute kids for pure shock value), but the message gets sent regardless. The Vanettis win this round. It seems like every week I come on here and tell you something else that 91 Days is “about” (generational gaps, chains of violence, family, etc. 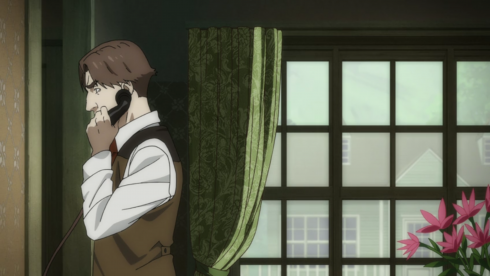 ), so here’s one more: 91 Days is about the access to and manipulation of information, and the power that comes with that. This is why the show is sometimes smothered in dramatic irony and other times tight with tension and uncertainty. It’s also a key element to understanding why many of the characters act the way they do. Which seems like an odd introduction to my Big Sad Corteo Character Analysis, but it’s vital to start there and remember not just what we know, but what Corteo knows. He was absent last week, presumably working at The Lodge (the booze must flow! ), and so he missed out on the chess match that went down between Angelo and Ronaldo. He has no idea that Angelo orchestrated the destruction of Nero’s family, leaving Nero himself an isolated, paranoid shell of his former jovial self. Instead, here’s what Corteo sees: His orphaned friend gets back from a road trip and is on friendly terms with Nero, one of the people involved in his family’s deaths. He continues to help Nero when he could easily have let him die (multiple times, in fact). After Nero kills his own brother, Angelo even offers to be his brother from now on–an eerie echo of the promise Corteo made to Angelo years ago. And now Angelo is threatening a man’s daughter and agreeing to help murder a family in the same cold “it’s just business” way his own family was murdered? That’s horrifying. That’s a lonely, traumatized child who’s been charmed by a cold-blooded, silver-tongued murderer and is slowly losing his soul to the devil. From Corteo’s perspective, Nero is destroying Angelo, and Corteo is the only one who can stop it. So of course he throws in his lot with Fango and tries to have Nero assassinated. And of course he can’t let the Vanettis find out about it. He thinks Angelo cares about Nero, after all (and there are still times when I think he’s right). If Angelo found out Corteo tried to have his new “brother” killed, he’d never forgive him. And that’s the one thing Corteo can’t stand to have happen. 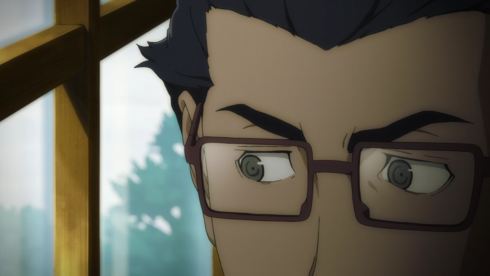 In a story about ulterior motives, it’s easy to see human weakness in everything, and I doubt Corteo’s motives are entirely as pure as he (and I) have made them out to be. There’s perhaps some jealousy in there, or anger at the Vanettis for dragging him into their world, too. 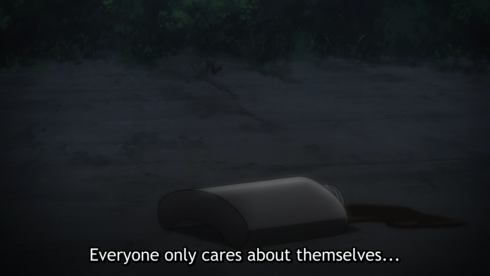 Even so, at heart, I do think he’s one of the few characters genuinely trying to do something for someone else. He had multiple opportunities to walk away this week, and he didn’t. 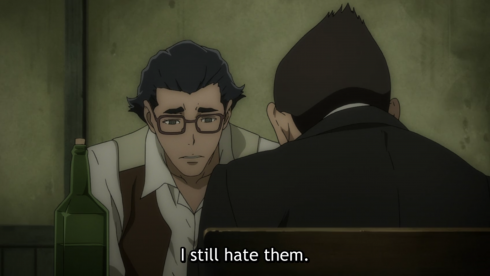 Corteo really is trying to protect his friend, even if he’s going about it as poorly as Angelo was trying to protect him. The problem, though, is the same one we’ve seen with both Angelo and Nero. Ends don’t justify means, and violence even for the sake of a lofty goal (seeking out justice for the dead, protecting the family, saving a friend) is still violence, and that has a lasting, destructive effect on a person. 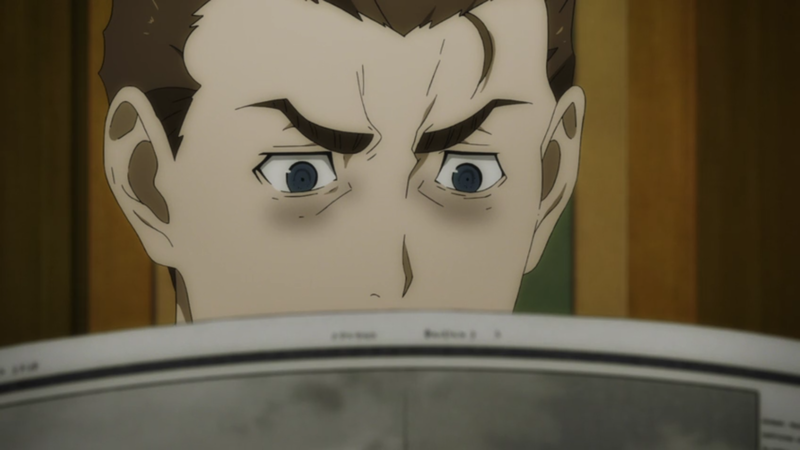 Three of the last five episode titles have been Macbeth quotes (“Blood will have blood,” “A poor player,” and “Brief candle”), and while the story of 91 Days isn’t much like Macbeth, they do share a lot of central ideas about the “slippery slope” of morality, and the strain murder and betrayal put on people despite their best attempts to justify their actions. 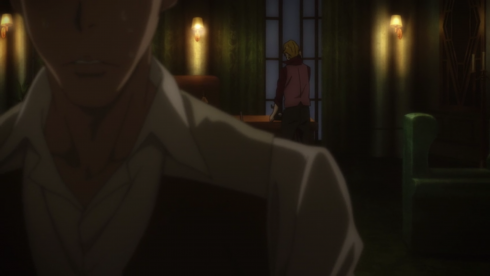 Corteo and Nero are both paranoid and jumpy this week–Nero struggling to sleep, Corteo drinking to calm his nerves–because of the violence and “betrayals” they’ve been a part of. 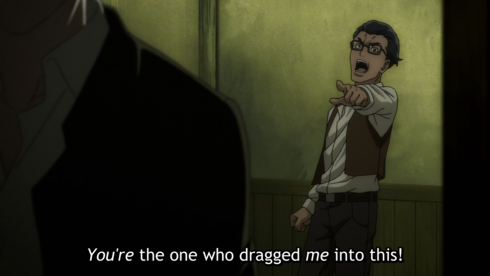 They’re also both justifying their actions by saying it’s “to protect” someone or something else, whether that’s “the family” or “the brother.” Granted, Nero’s decision to take out Delphy’s family shifts him into more clear-cut villain territory this week along with Angelo, while Corteo is still only going after known killers and direct threats. But we’ve seen where that kind of logic and behavior leads. 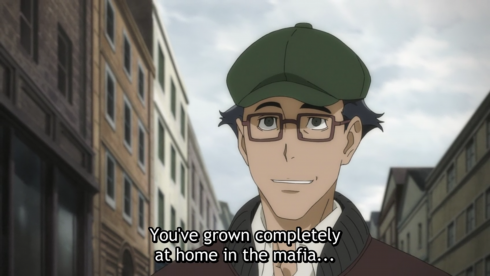 If Corteo’s smart, he’ll get out before he becomes exactly as ruthless as the mafia he hates. But I suspect it may already be too late for that. In addition to its painful depiction of The Last Good Man’s slide into duplicity and brutality, “Behind the Curtain” also looks fantastic, setting tone, revealing character, and dropping hints through its art and animation. The canted angles and limited long shots from the early episodes are back, now coupled with a mess of extreme closeups to create unbalance, claustrophobia, and heightened tension. Paranoia and isolation are the names of the game this week, and the camera knows it. Detailed expressions also convey a tremendous amount of wordless information about our cast. 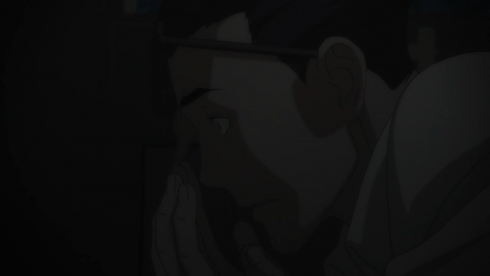 Case in point: Corteo’s face after Fango assures him everyone “goes home happy” when this is all over. That’s a kid who’s under no illusions about what’s happening here. He’s not even sure he can save Angelo, let alone himself. 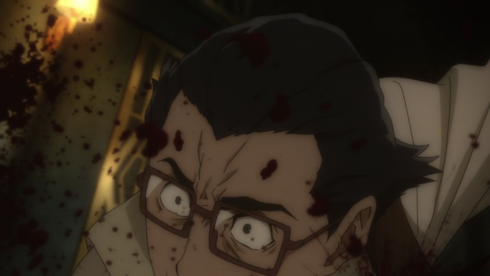 There’s a depth and raw physicality to the animation, not just in the sharp lines that crease and distort faces, but also in the explosion that tears through Delphy’s window and the blood splatters that seem to strike the camera during Corteo’s desperate attack. This is no light, breezy violence; it’s sharp, heavy, and brutal, and we can feel that weight as surely as our characters do. 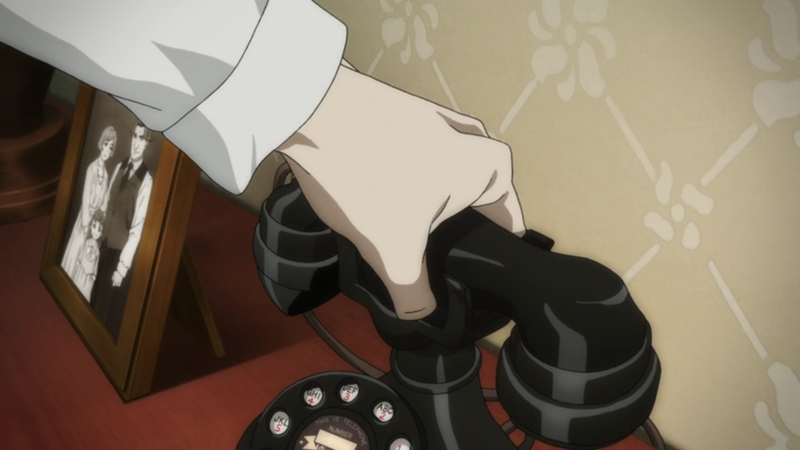 Maybe my favorite thing about this episode in terms of art and detail, though, is the way it focuses on objects to both hint and misdirect. Take the shot of Delphy reaching for the phone with the family photo in the background. It’s thick with dread, the kind of framing that would normally be followed by the family’s deaths. 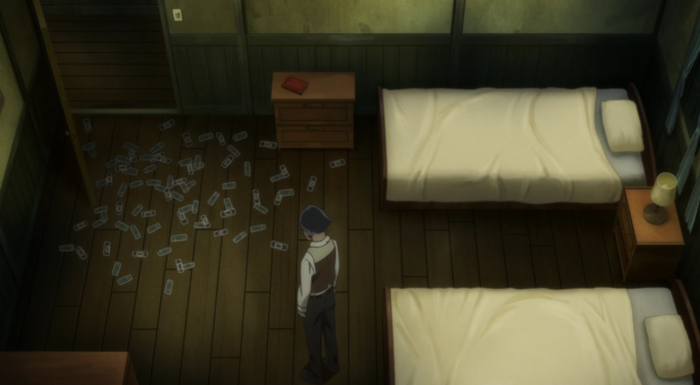 Yet 91 Days swerves, planting a teddy bear savior and surprising us with its unexpected mercy. The heavy focus on liquor is another clever (and mean) misdirect. Corteo’s descent into alcohol hearkens back to Don Orco quaffing his wine or Frate slamming is whiskey, and so it seems to seal Corteo’s fate. Spilled booze come before spilled blood, after all. We’re trained to know that this episode is going to end in death. 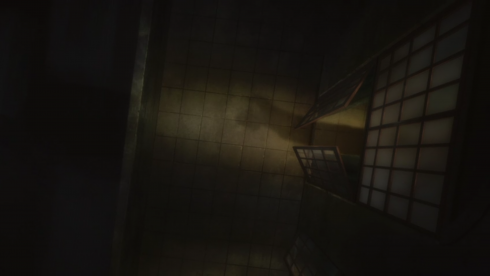 Then we get to Fango’s office, and 91 Days pulls some truly A+ foreshadowing, so much so that your blogger briefly forgot how chilled she was by that final shot of Corteo’s silhouette and could only laugh appreciatively. Because I was sure, I was so sure, that my poor sweet bootlegging baby Corteo was doomed. But then he walks into that room and Fango greets him in English with “Welcome to my castle!” And what, dear readers, is the name of the record Fango is listening to? Someone deserves a slow clap for that one. I wanted to end on that amusing note, despite the way the record skips as Corteo bludgeons Fango again and again, as the blood stains grow ever brighter, as this violent tune gets played on repeat, changing characters but never melody. I am, as ever, at a loss to guess where this series is going. Is it going to be the Shakespearean tragedy it hints at? Or is that, too, another misdirect, playing with our expectations about how these stories go? Whatever the case, I would like very much if Corteo could make it to college when this is all over. 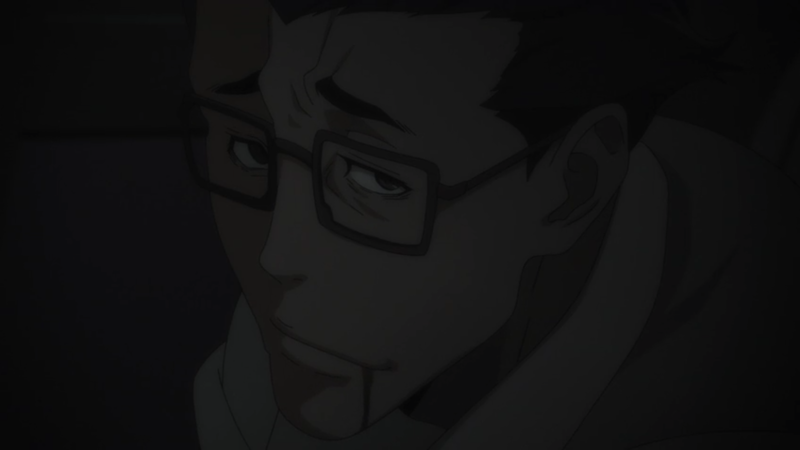 But at the rate our chessboard of players is getting cleared, I’m not even sure he’ll make it to Episode 10. It was SUPER WEIRD when Angelo laughed after Nero teased him about his bad driving. I’m not surprised they only showed it from behind. 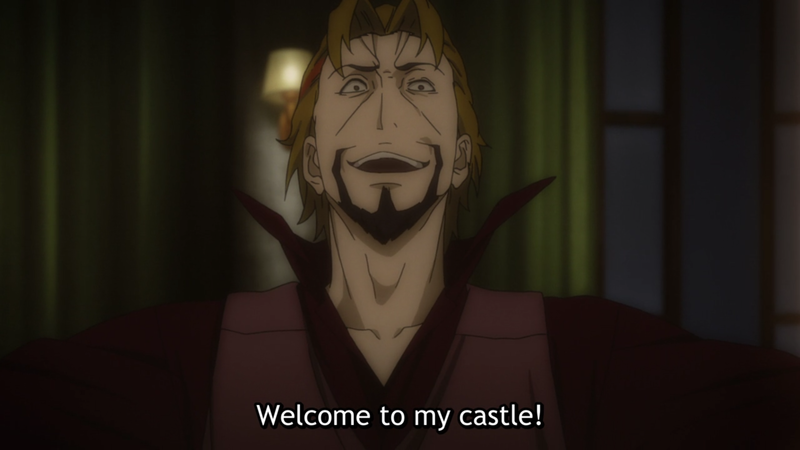 The animators probably have no idea how to draw Angelo with a happy face at this point. I’ve been nursing a tinfoil-hat theory for a couple weeks now that Corteo’s family was involved in the Lagusa murders and Corteo himself sent the letter as a way to make amends. That “I’ll be your brother now” echo does not help things. Theories are fun. Probably wrong, but still. Fun! 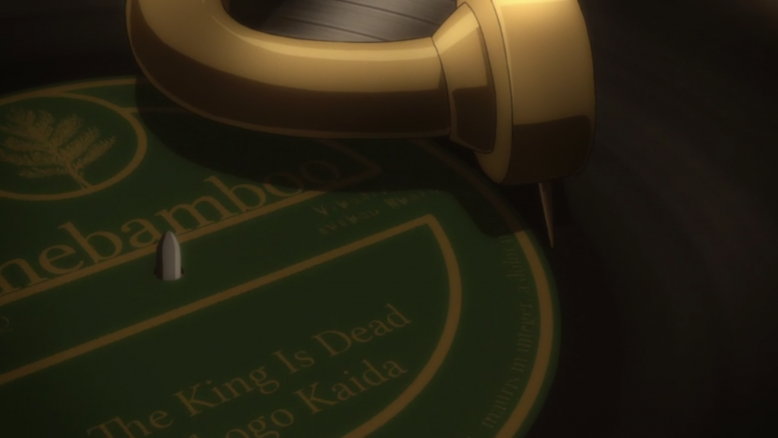 If you were wondering if “The King is Dead” by Shogo Kaida is a real piece, the answer is “yes,” but that’s because Shogo Kaida is the composer for 91 Days. I love that even in a show as grim as this they find a way to work in silly meta-jokes. History Corner! If Fango’s intel is correct and prohibition really is about to end, that likely puts our story in the spring/summer of 1932–possibly ’33, but by then Congress had already proposed the repeal of prohibition, so I’m sticking with ’32 for now. That also helps explain the relatively subdued tone of the town and series, as the U.S. was smack in the Great Depression at this point.